ASTRILAB is a unique platform for experiment, creation and communication. 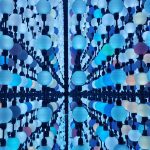 The Hypercube: a large scale cubic display made of 12 500 LED Balls. Hypercube presents volumes and data in space as a low resolution full depth information cloud in light and motion. The Gateway: it is a 4K multitouch screen were detailed information is elegantly presented. Touch and touchless interactions are possible to get into all Astri research field strata. The Brain Cloud: at the same time an innovative artistic installation by Maurice Benayoun and Tobias Klein, a world premiere, and a prototype for neuro-design technology. Brain Cloud is made of a massage chair, an EEG headband, an LCD monitor and, thanks to its connection to the Gateway and the Hypercube, it displays the 3D models resulting from the interaction as dynamic animated forms on the Hypercube and a full database of the brain production + brain waves monitoring on the Gateway. Is Virtual Art Quasi Art?